Natural Wonders of Africa: We strive to make your experience in East Africa memorable as we carefully and strategically add leisure and relaxation to an already exciting package of activities around East Africa. The breathtaking views also add to the enhancements of the adventure we offer to this experience of a lifetime. Incentives: To boost your successful Safari experience, we have included the provision of capable, trusted, caring, experienced and courteous guides to mobilize your adventures. Our team is disposed to your care during this exploration. Their knowledge of domestic and international tourism has resulted in several re-visits at higher than expected rates. Safety: Our primary objective is to keep our safari guests as close to the animals as possible while simultaneously exposing you to safe interactions with the wide varieties of our land animals. Observing these animals interacting in close proximity of our adventurers is simply breathtaking! Personal Approach to Each Client: We understand that there is no unique way to make a perfect journey that everyone will like because each person has his special needs and desires. We always listen to you first and then suggest the travel solution that is the best for you. Giving Back to our Communities: Through your visit to our great land, a 5% donation from all proceeds go to surrounding communities in our efforts to foster progress with local organizations. Teamwork: We partner with each guest to map out key points of interest for their explorations, broadening the scope of their unique experience for this adventure of a lifetime. With each agenda, we enhance your experience and provide services that are unmatched and unique to your standard of living. In this 16 Days magnificent safari, we invite you to experience all that Uganda has to offer. 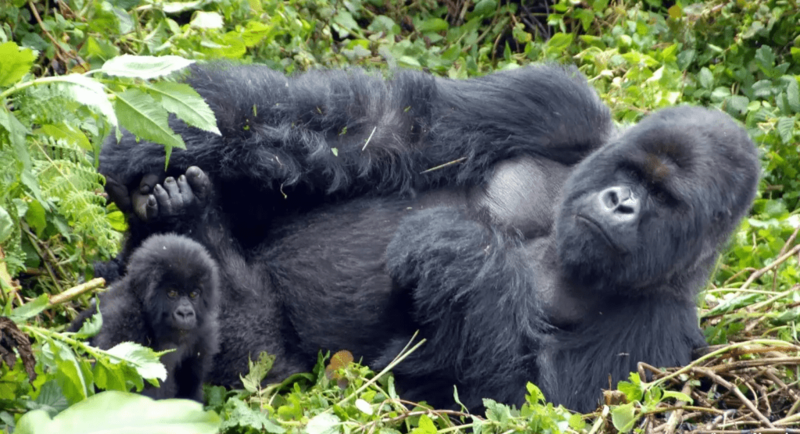 From the famous Murchison Falls and chimpanzees in Kibale National Forest to the mountain gorillas in Bwindi Impenetrable forest, this adventure gives you to the best of Uganda in just 16 days! 4×4 Safari Landcruiser / Minivan (up to eight passengers) with pop-up tops and seven window seats for game viewing. Groups of twelve or more people who would like to travel in one vehicle are offered 25-28 seat coasters that have about 16 window seats. Our Safari vehicles are well maintained to provide maximum level of comfort and safety. We recognize this for a fact! The success of your safari will largely depend on your driver/guide. It is because of this that we have a great team of carefully selected drivers /guides, well trained. Single Room Supplement: Most of the hotels have double rooms (A room with one big bed for 2 people or a room with 2 single beds occupied by 2 people) this means the 3rd person will be left without a room to stay and the alternative would be to occupy the single room (a room with one bed ). SRS apply for non-even (3, 5, 7, 9,11…) travellers. Therefore the SRS fee is be paid by the person occupying a room alone. During this thrilling trip, you will be accommodated at various accommodations. The accommodation is valid and will greatly depend on your budget. At whatever level, Kubwa Five Safaris provides the very best for you. Kubwa Five Safaris reserves the right to substitute equivalent or superior hotels. If a hotel of an equivalent standard is not available, Kubwa Five Safaris may substitute the next best quality hotel or suggest a superior at an extra charge. There is free Wi-Fi in hotels. Anderita Beach Hotel in Entebbe. Relax in your already-booked Anderita Beach Hotel after a long flight while you are dreaming of your rhino tracking tomorrow morning. Depending on the time of your arrival, you may be able to explore the sites in and around Entebbe. Murchison River Lodge is located on the southern bank of the River Nile overlooking Murchison Falls National Park, pods of hippos and papyrus islands. Red Chilli Rest Camp is superbly located to explore Murchison. We are at Paraa on the southern bank of the River Nile in the heart of the park. Our camp is just 500 meters from the Paraa ferry, where all vehicles cross the Nile for game drives around the Nile Delta, and from where boats can be hired for game viewing and sport fishing on the Nile – either up to the base of the Falls, or down to the Nile delta at Lake Albert. We have a fully stocked bar and restaurant below a large open thatched roof with spectacular views towards the Nile. The bar serves drinks from 6.15am until midnight and meals are available at the following times: Breakfast 7.20am – 10.30am, Lunch 11.30am – 3 pm, Dinner 6.30pm – 9 pm. The Kibale Forest Camp offers an affordable classic canvas experience in the form of 10 African safari style tents tucked away in a lush forest. Kibale Forest Camp is located in a patch of evergreen forest, just outside the southern part of the national park. It borders the Magombe swamp, known for the Bigodi Wetland Sanctuary and is a mere It is a 10-minute drive to Kanyanchu Visitor Center, the place from where your chimp track will start. Ruhija Gorilla Lodge is located in Luhiza. Free WiFi access is available in this chalet. Featuring a shower, private bathroom also comes with free toiletries and slippers. You can enjoy mountain view and garden view from the room. Extras include a tumble dryer. It is strategically located to allow maximum adventure time. Best Lake Bunyonyi Hotels; Birdnest at Bunyonyi Resort is a classy, quiet, luxurious and high end resort located on the shores of Lake Bunyonyi in Kabale, Uganda. The resort is ideal for guests travelling for leisure and adventure. Free WiFi is available. The resort features clean and well maintained rooms all fitted with a comfortable bed and beddings and a desk. All the rooms have a lake view and some have balconies. a peaceful place with great views just outside the park. The comfortable and spacious cottages are dotted around the hill, all very private and offers great sunset views. At night the sounds of bush come to life and allow your imagination to run wild. There is a swimming pool too! Rhino tracking in Murchison Falls National Park, this can be done on day 2. 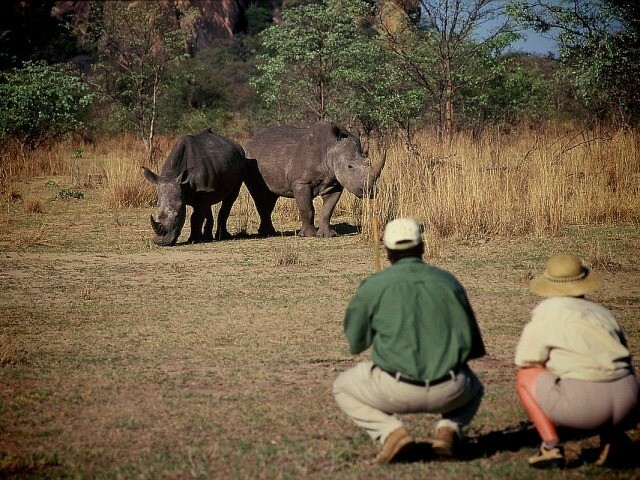 At the Ziwa Rhino Sanctuary you will go together with an experienced ranger for a safari hike to the rhinos. You will see the rhinos in a very close range! Kidepo Valley and Murchison Falls National Parks once had both black and white rhinos; however widespread poaching during the Idi Amin era resulted in the disappearance of these majestic animals from the wild. Founded in 1998, Rhino Fund Uganda works to reintroduce black and white rhinos into Uganda and runs a breeding program, as well as work to educate communities on endangered rhinos. Costing: USD $40 per person. Chimp tracking in Budongo forest, this can be done on day 2. Budongo Forest is located in the southern part of Murchison Falls National Park., and has the highest number of wild chimpanzees of Uganda. The habituated groups are located in Kaniyo Padibi, where you can go for chimpanzee tracking. Budongo Forest has an incredible biodiversity that – beside the chimpanzee – includes several other species like the Blue monkeys, Red-tailed monkeys, Vervet monkeys and Olive baboons. Costing: USD $95 per person in high season and USD $85 per person in low season. Hot air balloon safari, this can be done on day 3. Discover Murchison Falls from the air! Sign up for this optional activity and enjoy to unique experience of flying over Murchison Falls NP in a hot air balloon. You will have the most amazing views over the river Nile, Lake Albert, the great Murchison Falls and of course this is thé best way to spot lots and lots of animals. You will start early morning, so you will see the sun rise over the park. After your balloon safari you will have a bush breakfast in the park (inclusive). Costing: USD $380 per person. Chimpanzee habituation tracking in Kibale National Park, this can be done on day 5. At an additional fee of only 70 USD per person, you can do the chimpanzee habituation tracking instead of the regular chimpanzee tracking. This will take all day and you will be 100% sure to have a very close encounter with your closest relatives. Book this in time because only six persons per day are allowed to go. Your swamp walk can be postponed to the next morning. Lion Tracking in Queen Elizabeth Park, this can be done on day 7. For visitors who yearn to get up close to wild African fauna, a research trip is a rewarding adventure. This new and unique experience allows visitors to actively participate in monitoring some of lions in the park, using locator devices and learn habituation calls, as well as monitoring weather, surroundings and behavior. The results are added to researchers’ databases, contributing valuable information to the overall understanding of wildlife ecology – and helping to conserve this wonderful ecosystem. This will as well give you a 95% chance to see the lions! The number of people on each outing is limited in order to reduce stress on the animals and to increase the quality of the experience for visitors. Costing: USD $85 per person. Chimp tracking in Kyambura Gorge/ Queen Elizabeth Park, this can be done on day 7. The spectacular Kyambura Gorge also called the “valley of apes”, is located in the eastern corner of Queen Elizabeth. The landscape is among the most impressive you will find in Uganda. Enter into the Gorge and you will be marveled by the verdant, rich tropical rain-forest right close to the equator crossing. You can make a wonderful hike here looking for chimpanzees. Chances of seeing chimps are 50% and that is why you rather call it a nature walk. Don’t miss it; the gorge is simply amazing! . Costing: USD $50 per person. Night Game Drive in Lake Mburo National Park, this can be done on day 10. A night game drive in Lake Mburo national park is absolutely great! 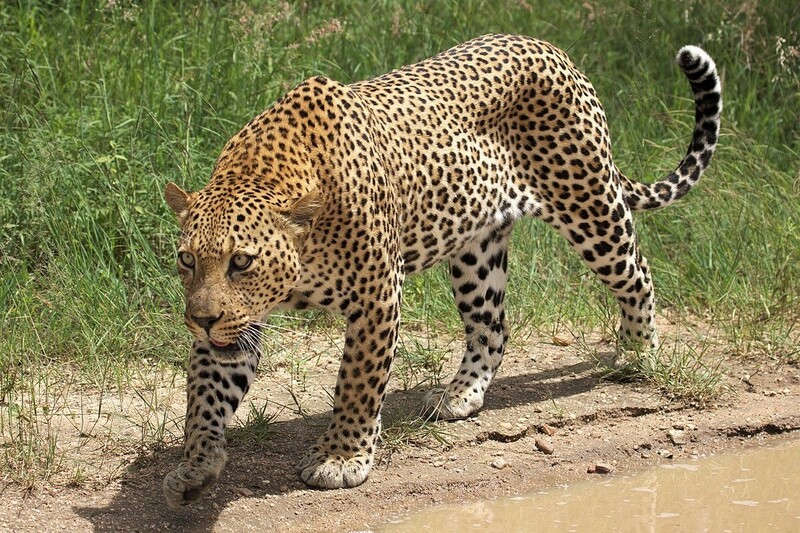 You have chances of seeing Hyena, different nocturnal animals and it’s probaply your best chance to spot a leopard. Your night safari is either just before dinner or just after dinner and takes about 2 hours. Mountain Bike Safari in Lake Mburo National Park, this can be done on day 12. It’s very exciting to make a safari by mountain bike. Get active and get close to zebra, gazelle, Eland and sometimes even giraffe! Overnight in Kampala, this can be done on day 16. Overnight and Dinner at Sky hotel. Sky hotel in Kampala located 10 Km from the city center towards Naalya Housing Estate, it has a capacity of 29 Rooms with twin beds taking up 58 guests, there is one restaurant, which is open from 7-10 am for breakfast. However, it is open for the rest of the day for meals. Travel to Jinja, city tour, this can be done on day 17. Explorers River Camp: Situated 8km from Jinja town overlooking the new Lake Bujagali, Explorers River Camp is often referred to as one of Uganda’s, and even Africa’s most memorable places to stay. Fantastic views of the Nile, a well-stocked bar and excellent meals have made this site one of East Africa’s most popular places to stay. Whether you are camping, staying in dorms or rooms, our bar deck overlooking the river is the perfect place to enjoy a cold beer and amazing sunsets. The trees above boast a multitude of tropical bird life and monkeys, and the ‘riverside showers’ alone have become famous for the incredible scenery they overlook. Lush terraces offer secluded safari tents with stunning views of the Nile. Our safari tents have become extremely popular and numbers are limited so it is strongly advised you book well in advance. In addition to our terraced safari tents we also offer standard safari tents and en-suite rooms. Jinja Nile Resort rests on the banks of this magnificent River and offers magnificent views of the Nile and the rich fauna that it attracts. It offers services for both the business traveler and holiday maker. The cottages and hotel services are spread over 30 acres of gardens allowing one to appreciate the beauty of the Uganda…the pearl of Africa. Activities available from the resort include white water rafting and bungee jumping. It was voted best weekend getaway and best country hotel in Uganda by Travel News magazine in the year 2005, 2006, 2007 and 2008. Whitewater rafting & discovering the River Nile, this can be done on day 19. Have an early breakfast and head out for today’s activities. The Nile River finds its source in Jinja where it starts the 4000 km through different African countries. So your driver will take you to where the beginning point is as you go for discovering the Source of the Nile; you will go for a guided boat cruise on the Nile. After the boat ride, go for half day rafting on the rapids which is an adventure and an unforgettable experience. Have lunch and after you could choose to rest at the lodge on the swimming pool or go for optional activities like bungee jumping or kayaking or quad biking or Horse riding. Return to Kampala the Entebbe International Airport, this can be done on day 20. Take breakfast leave Jinja for Kampala buy some souvenirs to take home with you. If you have a flight on the same day your guide will transfer you to Entebbe International Airport for departure flight home. Please book your flight to arrive at Entebbe International Airport (EBB). Transfer from and to the airport is included. Kubwa Five Safaris will pick you up from the airport. Airport: Entebbe International Airport Airport transfer included: Entebbe International Airport No additional charges. You can request this in the next step. A reservation requires a deposit of 65% of the total price. The rest of the payment should be paid 42 days before arrival. On your arrival, Kubwa Five Safaris representative with your name printed on an A4 paper will welcome you to Uganda at Entebbe airport and transfer you Anderita Beach Hotel in Entebbe. After your first night in Uganda it is time to begin your journey. Your first stop today will be at Ziwa Rhino Sanctuary. This is the only place in Uganda where you will be able to see the white rhino. The drive from Entebbe to Ziwa takes about three hours. After rhino tracking it is time for lunch and then continuing on to Murchison Falls National Park. You will stay in a very nice tented camp here on the shores of the Nile. After another game drive in Ishasha it is time to move to Bwindi Impenetrable Forest, home of the famous mountain gorillas. Check in at Ruhija Gorilla Lodge and prepare for yet another highlight of this amazing trip: tracking mountain gorillas! Lake Bunyonyi is one of the highest lakes in Africa. It is also one of the only lakes around where you can swim safely. Here you will have time to relax, swim, go for a ride in a dugout canoe or just sit by the side of the pool and read a book! For those who would like to do a village walk or visit one of the indigenous tribe, it is possible to organize a visit with the local Batwa people. The majority of your day will be spent preparing for your journey back time. Depending on the time of your return flight, however, you may have some time to visit the Botanical Gardens or have a meal on the beach of Lake Victoria. We hope you have enjoyed the journey! Want to be notified when our Hot Safaris are published? Enter your email address and name below to be the first to know.